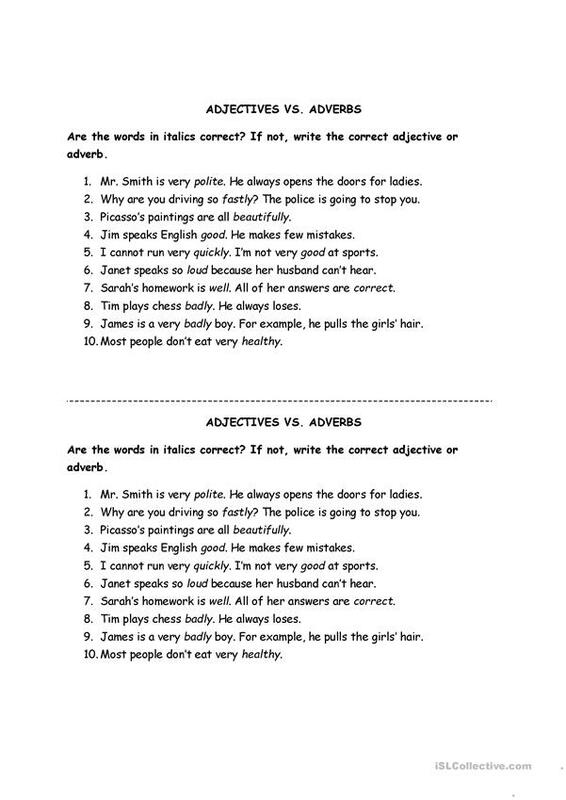 Ten sentences with adjectives and adverbs. Students have to decide whether the right part of speech is used in each case and if not, they have to correct the sentence. The above downloadable printable is best suited for business/professional students, high school students and adults at Elementary (A1) level. It is a useful material for consolidating Adverbs in English, and is useful for strengthening your pupils' Speaking, Reading and Writing skills. zsofig is from/lives in Hungary and has been a member of iSLCollective since 2011-11-17 19:22:15. zsofig last logged in on 2013-07-09 16:00:03, and has shared 9 resources on iSLCollective so far.